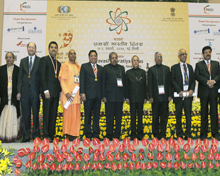 The three-day Pravasi Bharatiya Divas concluded on January 9 at Mahatma Mandir in Gandhinagar in the presence of Vice-President Mohammad Hamid Ansari, who gave away ‘Pravasi Bharatiya Samman’ awards to 15 members of the Indian diaspora. The recipients were Guyana President Donald Rabindernauth Ramaotar, Mala Mehta, Dr Rajaram Sanjaya, Kanwaljit Singh Bakhshi, Rajmal Parakh, Duraikannu Karunakaran, Essop Goolam Pahad, Shah Bharatkumar Jayantilal, Ashraf Palarkunnummal, Mahendra Nanji Mehta, Professor Nathu Ram Puri, Satyanarayn Nadella, Dr Lulla Kamlesh and Dr Nandini Tandon. Nadella, Indian-origin CEO of Microsoft, was not present to accept the award. In his valedictory speech before the gathering of over 3,000 non-resident Indians (NRIs) as well as persons of Indian origin, Ansari called for greater participation of diaspora to contribute in building a new India. "Overseas Indians can play a major role in building a new India, as they are having experience and resources to deal with problems. They have taken initiatives to transform the country in which they are living. We welcome them to replicate those initiatives here," said Ansari. Also present were External Affairs Minister Sushma Swaraj, Minister of State for External Affairs Gen (retd) V.K. Singh, Gujarat Chief Minister Anandiben Patel, Gujarat Governor O.P. Kohli and president of Guyana Donald R. Ramotar. 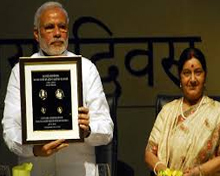 Swaraj lauded the efforts and struggle of overseas Indians and said that Indian diaspora is very dear to Prime Minister Narendra Modi. "Overseas Indians overcame hurdles and achieved success. They are proud citizens of their country, but, their heart still beats for India. Indian diaspora is close to Modiji's heart. He appealed to them to contribute in India's development whenever he went on foreign tours," Swaraj said. "I am happy to see so many young NRIs here. It is time for Bharat Banao (make India) and Bharat Me Banao (make in India). 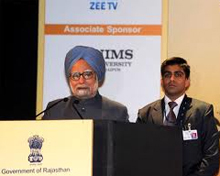 Modiji is having a mission of Remake India and young Indian diaspora can play a vital role in realising that vision. We can partner in India's growth story," said Swaraj. Chief Minister Patel promised that the NRIs will find a cleaner Gujarat when they come next time. "When on India visit, NRIs feel disappointed about sanitation scenario here and wish to see a cleaner country. I want to promise them that when you come back, you will be able to see that change, as Gujarat has put extra emphasis on Modi's call to make a cleaner India by 2019," said Patel. On 7 January 2015, the youth segment of PBD will be inaugurated with the theme Bharat ko jano and Bharat ko mano. The aim of the youth segment is to familiarising children of migrant Indians with the traditions and history of the country as well as its modern day achievements in different fields. The main highlights of the 13th PBD will include a plenary session in which presentations will be made on the flagship programmes of the government such as Namami Ganga, Swachh Bharat, Skill Development and Urban Development and NRIs and People of Indian origin (PIO). Besides, there would be separate sessions for Girmitya, Indian migrants taken to work in plantations, Gulf countries, French speaking countries and Diaspora organisations in various countries and the Ambassadors of these countries would be present to understand their problems. PBD is the world's largest annual gathering of people of Indian origin. PBD is aimed at enhancing networking and reinforcing commercial linkages. There are 25 million people of Indian origin residing outside India. Every year 9 January is being celebrated as NRI day (Pravasi Bharatiya Divas) to commemorate the return of Mahatma Gandhi from South Africa in 1915 to plunge into the Independence struggle. The grand event attracting thousands of Indian diaspora is organised jointly by the Ministry of Overseas Indian Affairs, the FICCI and the CII (the trade bodies). A gala three-day jamboree is held to culminate on January 9 during which a host of foreign delegates and distinguished persons from the diaspora share dais and exchange notes on how to promote their interests. Each year a theme is chosen and speeches are given on myriad issues that impact the welfare of NRIs and PIOs across the world. Moreover, President confers awards to those who had excelled in various walks of life in their adopted countries, thus proving as goodwill ambassadors of India to distant lands. 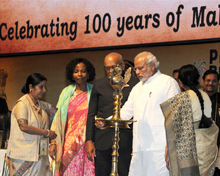 The 13th Pravasi Bharatiya Divas in 2015 was a gala affair with Prime Minister Narendra Modi assuring all help and incentives to NRIs. 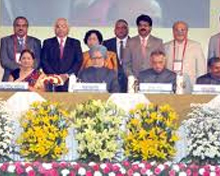 It was held at Mahatma Mandir, Gandhinagar, Gujarat. The theme for this year was "Apna Bharat, Apna Gaurav".